Visiting the Amazon rainforest had been a dream of me for a long time. As a child I was already fascinated by the size on the map and so many cool animal species. The Amazon basin includes parts of nine nations. Ecuador is one of them. 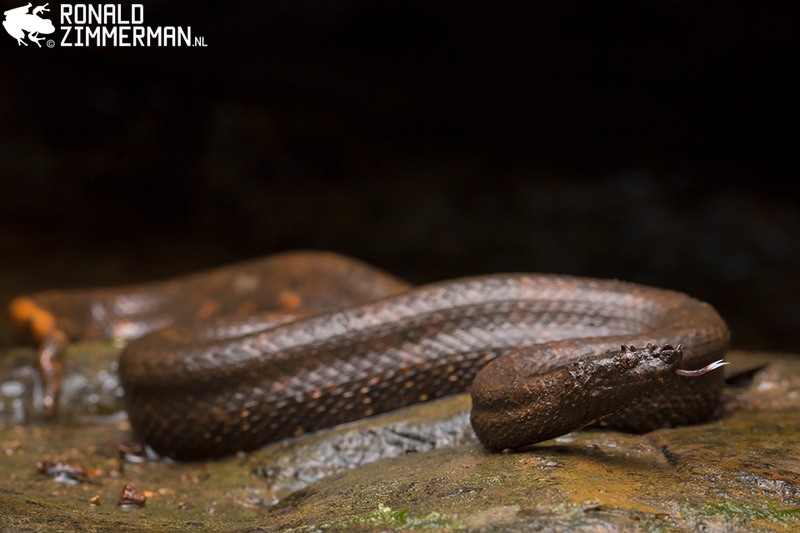 The past four years I have seen phenomenal photos of Tropical Herping and other amazing photographers working in Ecuador. 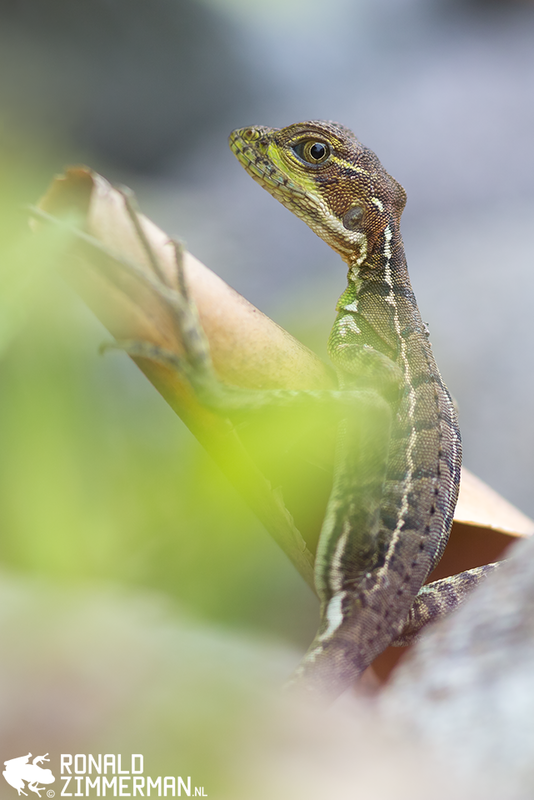 Many of the photos included breaktaking animals I had never seen before like the Pinocchio anole. Last year the plans got serious and Dieuwertje, Jasper, Sander, Jorg, and I decided to visit Ecuador. 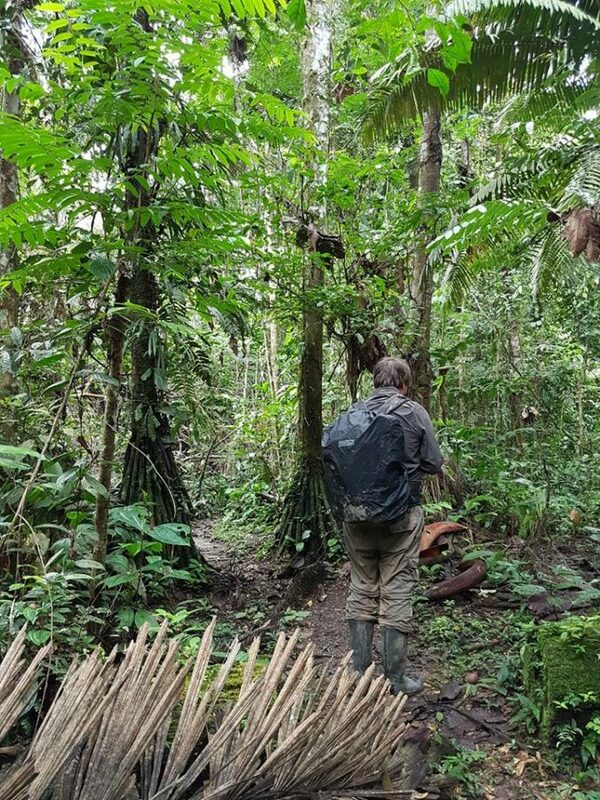 The Amazon was part of this adventure in Ecuador. Termas de Papallacta was our first episode of this adventure in Ecuador. This resort was on the edge of the Cayambe Coca Ecological Reserve. It is not far from Quito and is home to animals like the spectacled bear and mountain tapir. An ideal location after a long journey from the Netherlands. On the first day we started optimistic, until we found out how cold and wet it really was. It was comparable to autumn in the Netherlands. It was like: “welcome to November!”. It was not all misery. 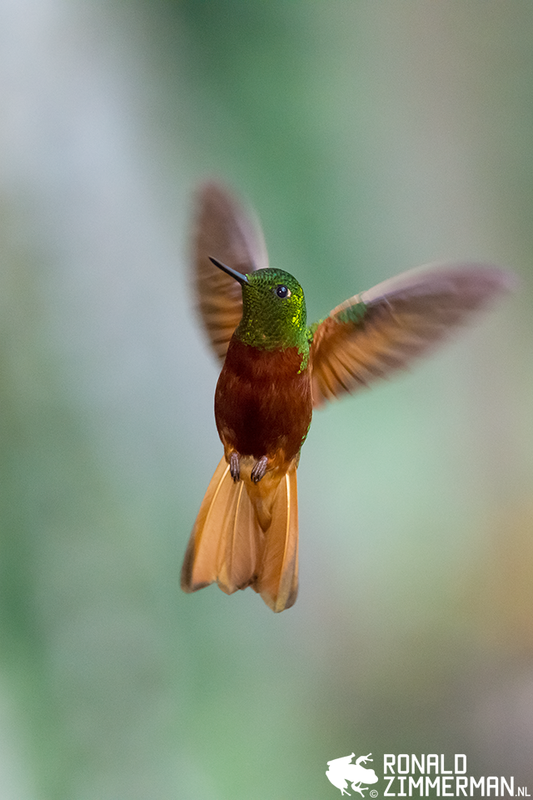 We had very nice hot springs and a Sword-billed Hummingbird Ensifera ensifera around the house. 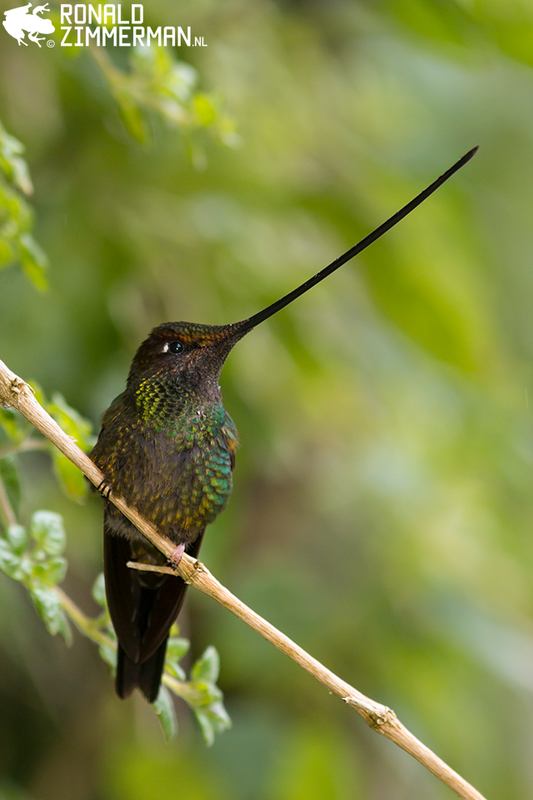 The Sword-billed Hummingbird is noted as the only species of bird to have a bill longer than the rest of its body. This adaptation is to feed on long-tubed flowers. 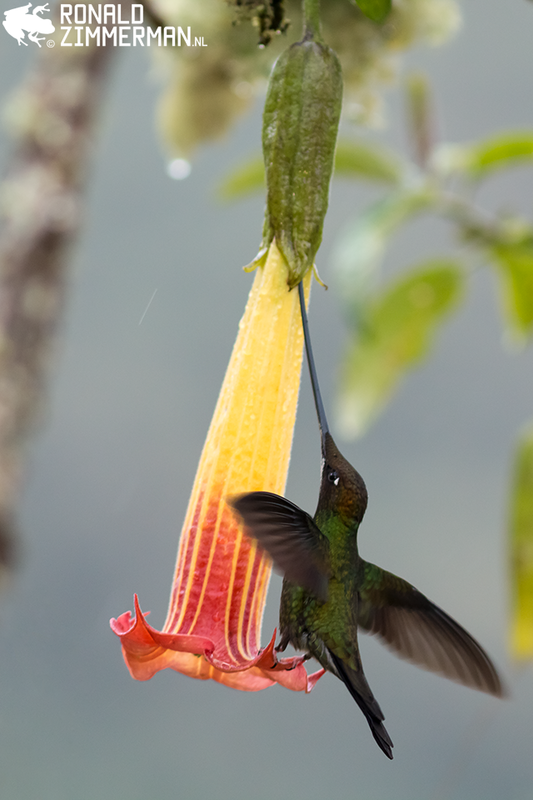 A big advantage of this adaptation is less competition for food from other species of hummingbird. The bird was definitely something special! The weather, high altitudes (headaches), and the lack of wildlife were a bit of a buzzkill on this location. It was draining my energy away. I was photographing the ironically called Shining Sunbeam (photo below), but even this warm named hummingbird did not warm me up. When I go to a location in the mountains I know I will not find many amphibians and reptiles. 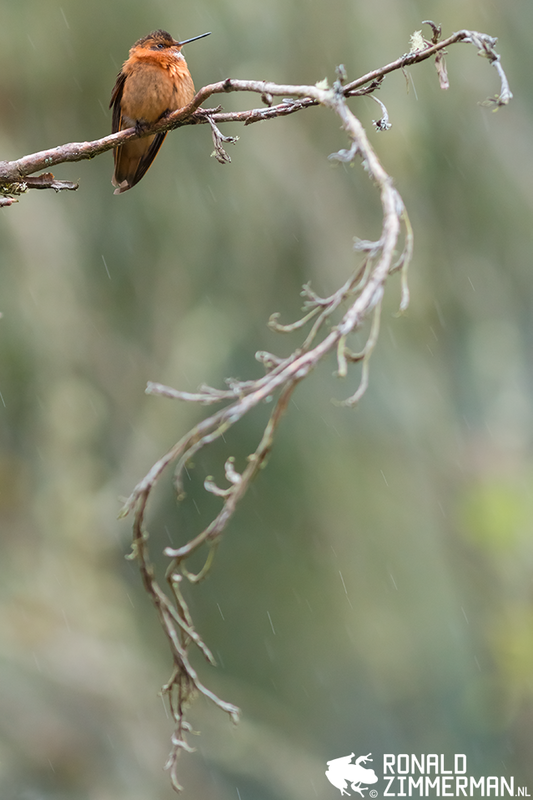 I enjoy wide mountain views and nice walks, but with all the mist, cold and rain there was nothing left for me in the Cayambe Coca Ecological Reserve, except for some very special hummingbirds. I was probably there in the wrong season, or it is not a suitable location for me. From now on the adventure in Ecuador could only get better. It did not, for now. 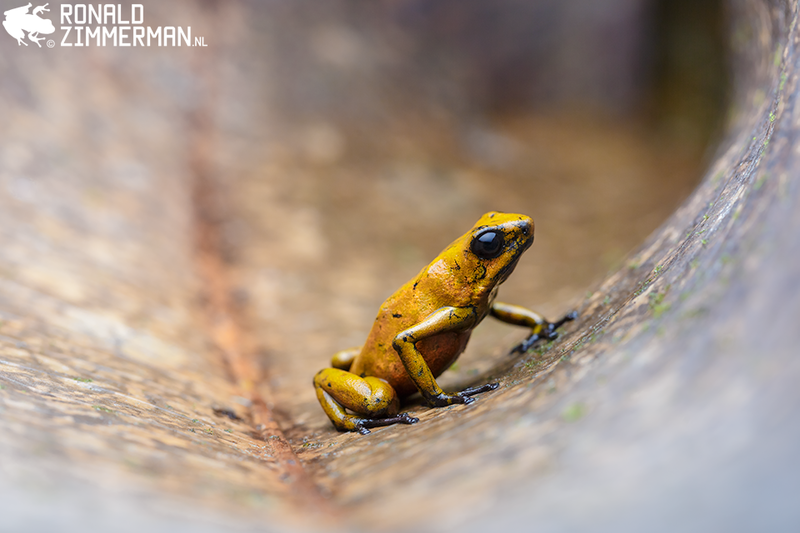 It almost took us longer to arrive in Yasuni National Park than traveling from the Netherlands to Ecuador. The night before our journey to the Amazone there was a landslide on the road. The road was blocked and we couldn’t get past. A day later than we had planned we had arrived at the Estación Científica Yasuní. It was a very inspiring location (stunning photography on the walls) with a nice group of researchers, and surrounded by rainforest. From now on it got a lot better for me. On my first night I went surveying with Twan and his father Ton. It turned out to be a great night. It was the first good night for amphibians and reptiles this adventure. 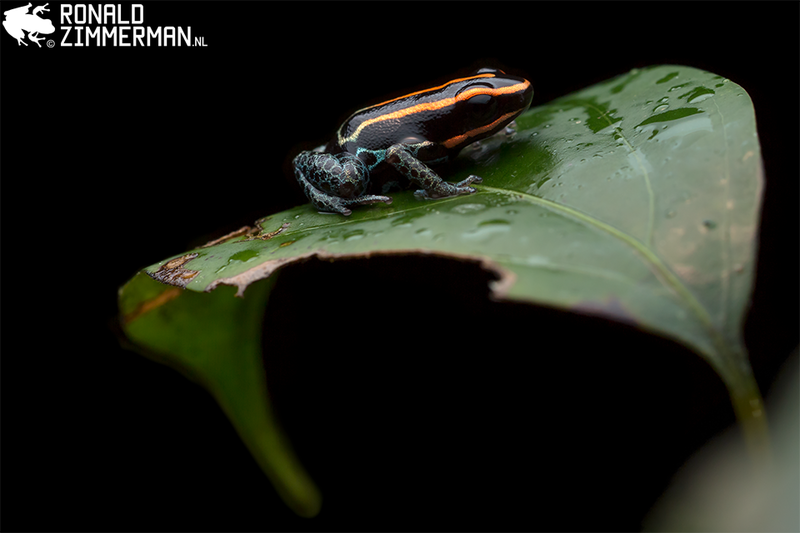 The Amazonian Poison Frog Ranitomeya ventrimaculata is certainly one of the most beautiful frogs I have ever seen. 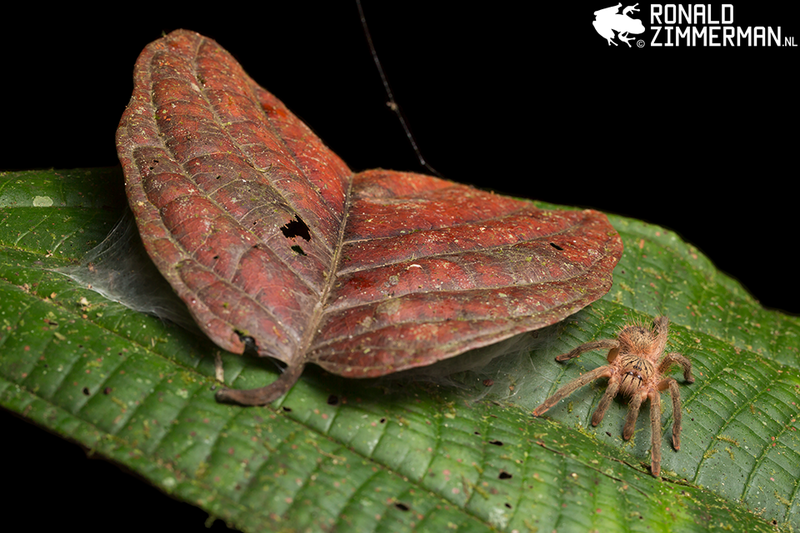 During the day they are foraging in the leaflitter, but at night you can find them sitting on a leaf. 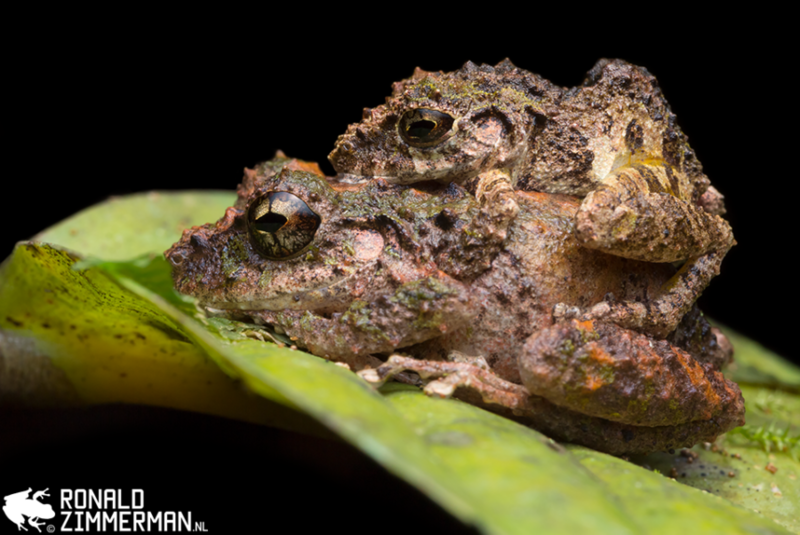 We saw two of them sitting on a leaf during the first night in Yasuni National Park. What a start! We found a tropical climbing salamander almost at the start of the trail. 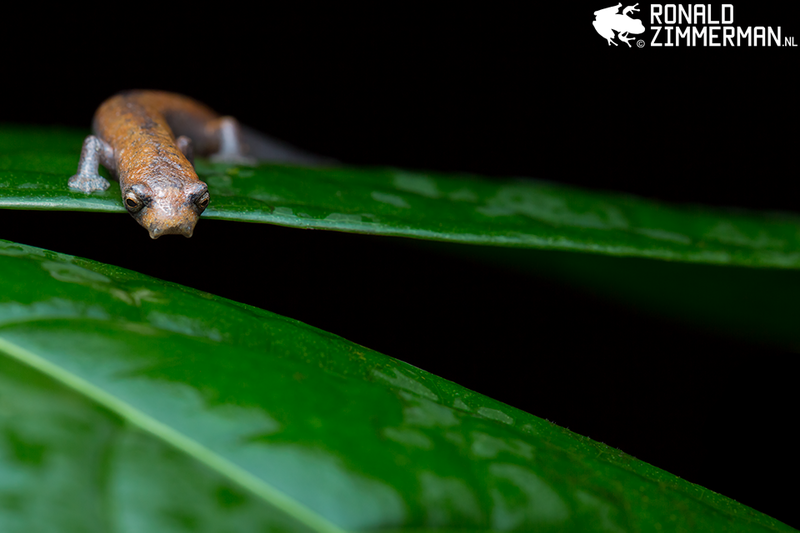 The Bolitoglossa altamazonica occurs on low vegetation in lowland rainforests like Yasuni National Park. 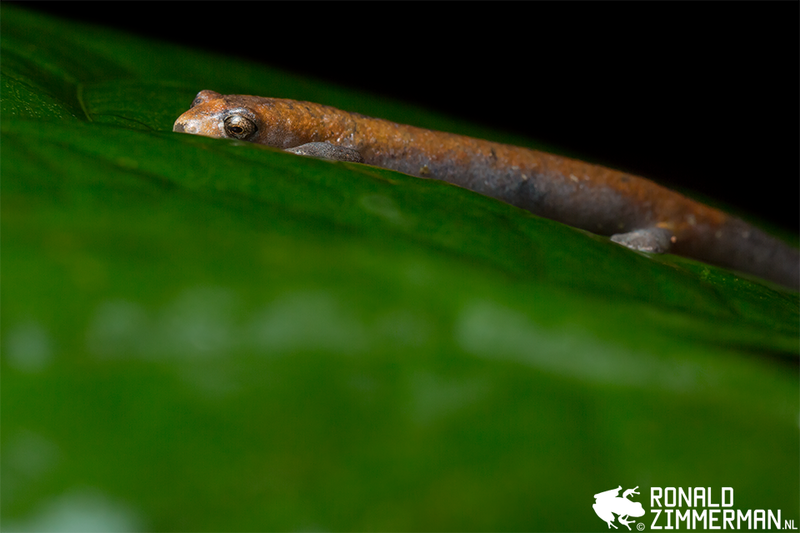 It was my second Bolitoglossa ever, so I was excited! My first Ecuadorian snake was a pretty one. It was a Common Blunthead Imantodes cenchoa. This is a rear-fanged colubrid snake. I like the slender bodies and very large heads. The snake was not very cooperative, or else I would have tried more compositions. Forcing a snake into desired positions can be very stressful for the snake, so I will do it only briefly or not at all. I was quite satisfied with the animals we found on this first night. I also made some photographs I like a lot. Finding out that my friends who stayed at the research station saw two coral snakes while walking out of the restaurant was killing the excitement a bit. Also at daytime the trails were absolutely beautiful and the idea that around every corner there could be an amazing creature is very exciting. That is why I love rainforests in general! 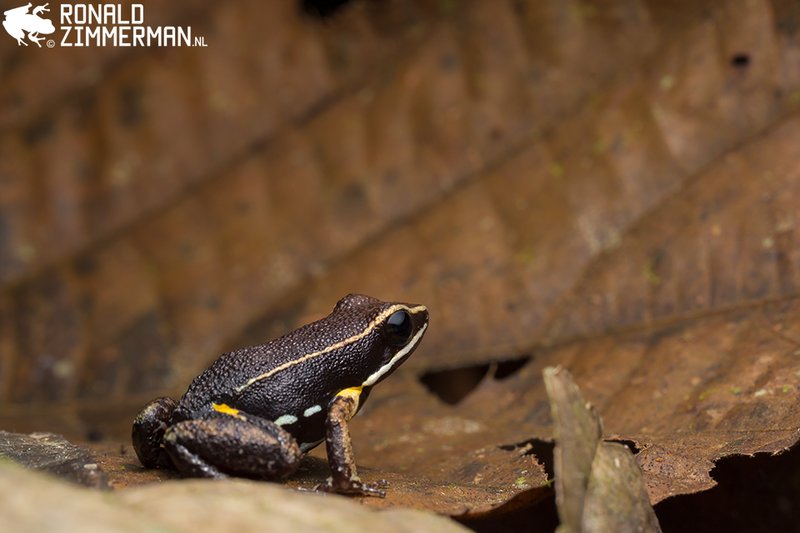 In Yasuni National Park we had moments during the day where we found nearly nothing. The idea of having so many magnificent species around you is like teasing. If you do not find them, not very pleasing. 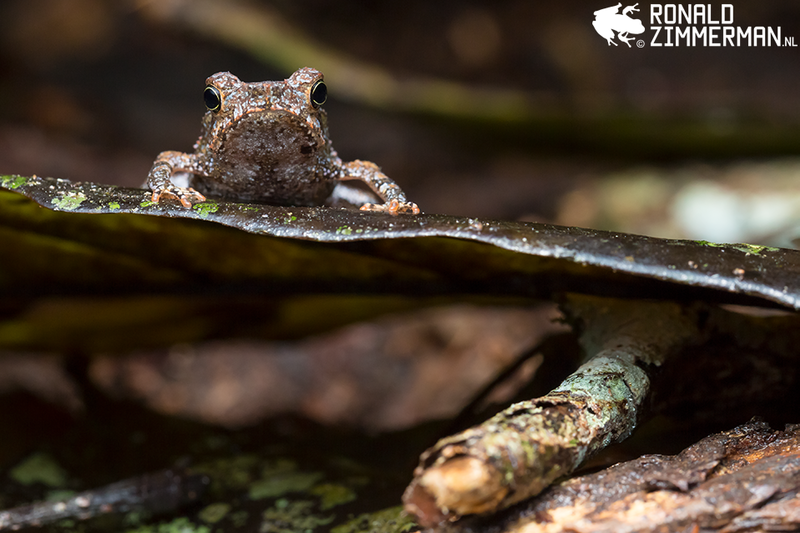 The amphibians we did find were mostly Rhinella species like the South American Common Toad Rhinella margaritifera. For me this toad is something uncommon. 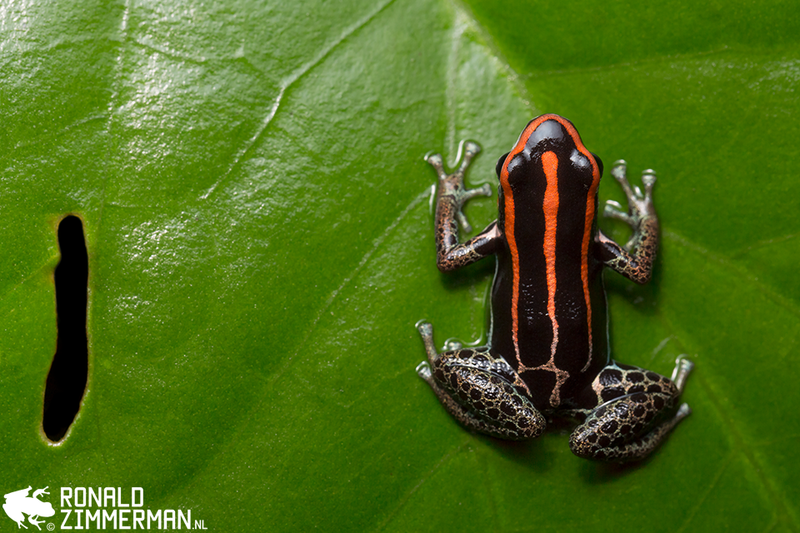 I love the orange and blue colors of this little toad! 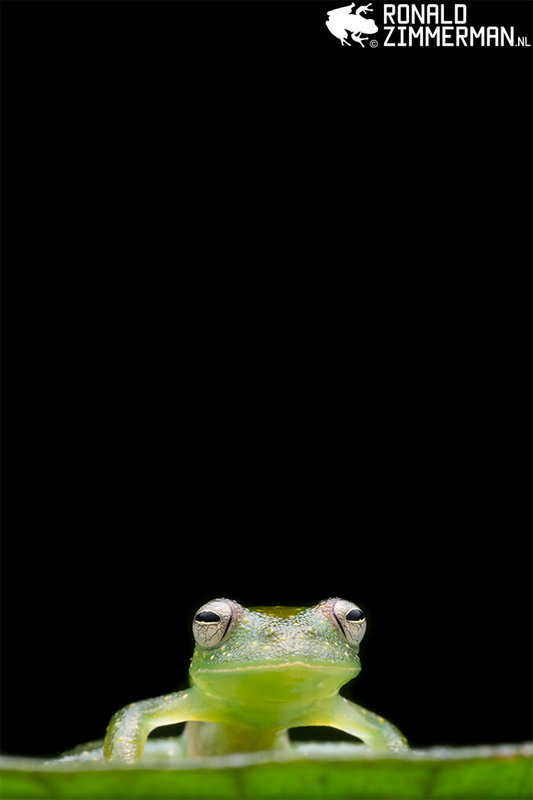 Ground dwelling amphibians are mostly from above. That is why I have photographed this Rhinella sp. from a bird’s perspective. When I find animals I look for creative compositions, but not this time. This photo is something different than I already have, which makes it creative in a way. 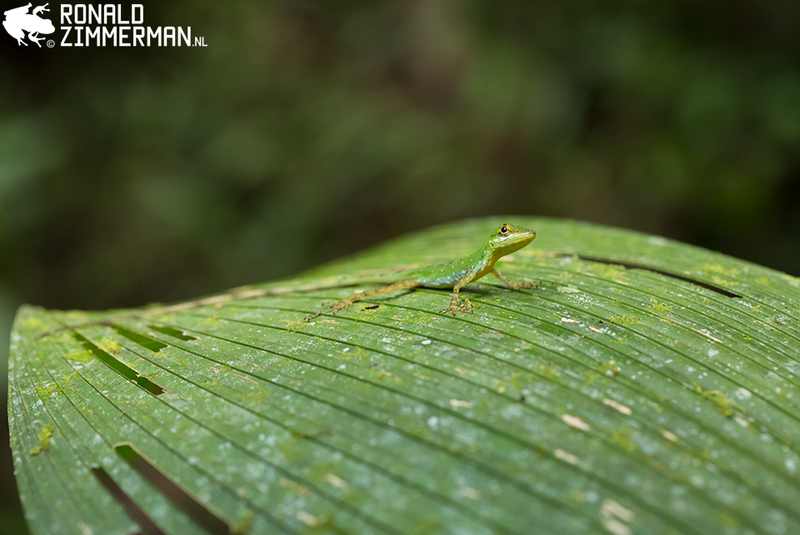 It was not just hard to find animals in Yasuni National Park, but sometimes they were also too hard to catch on photo. Some amazing species were being themselves and escaped before I had a chance of photographing them. There were moments that I was was lucky. 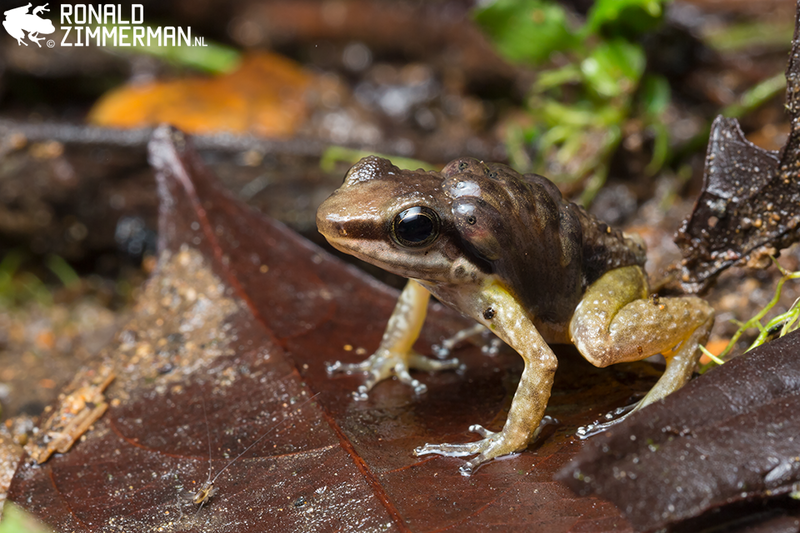 The Brilliant-thighed Nurse-Frog Allobates femoralis was a very jumpy frog and not really willing to pose. The pose I got is quite typical. When you see them, you see them jumping away from you. Fortunately for me, not fast enough this time. “Every step I take, every move I make. Every single day, every time I survey. I’ll be carrying you.”. Yes, this is about my camera bag. Sometimes I want to travel light, but I never want to miss an opportunity to make my best photograph. Without extra water, my bag weights 11kg. A great tortoise workout as you can see on the photo. I love Gonatodes! I had hoped to see at least one specimen. 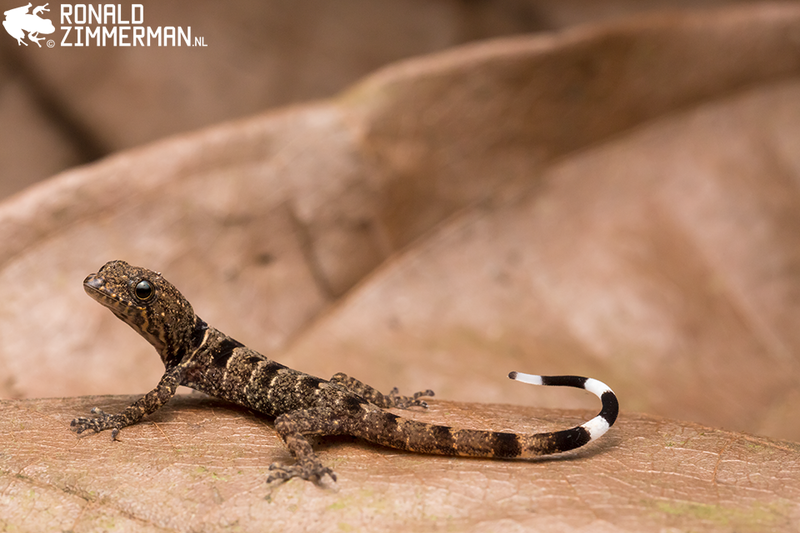 I was very happy when Jasper found this Bridled Sun-Gecko Gonatodes concinnatus. The gecko was very cute and cooperative. The way the tail moved around was amazing! It looked like a black and white whip. The Bridled Sun-Gecko started licking the eyeballs to keep the eyeballs clean and moist. Geckos can not blink their eyes to keep them clean and moist. An awesome moment to catch on a photograph. 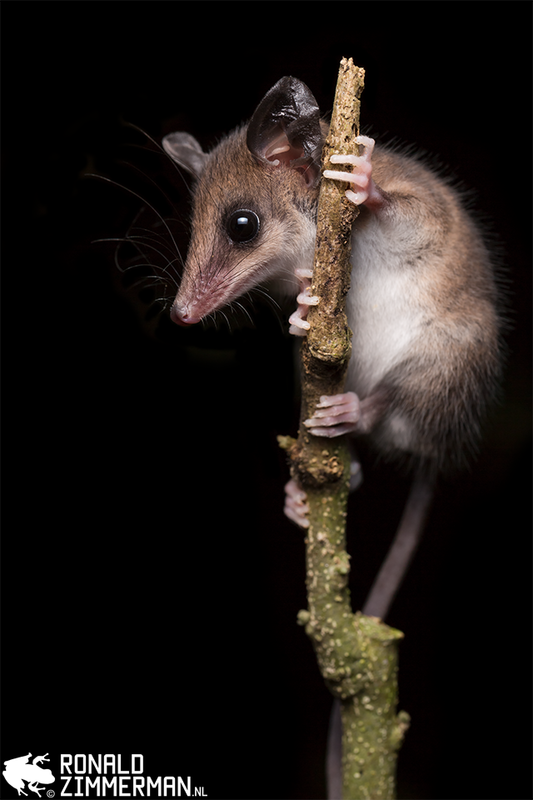 A pleasant surprise was the brave White-bellied Slender Opossum Marmosops noctivangus holding on to a very thin stem at almost one meter from ground level. The opossum did even move a finger. I rarely see wild mammals from this close, so it was a great experience while looking for “cold blooded” animals at night. Except for the first night hike we did not find many amphibians and reptiles on the trails. However searching around the research station was very successful. The Amazon Tree-Boa Corallus hortulanus is a common snake throughout much of its range, persisting wherever trees remain. 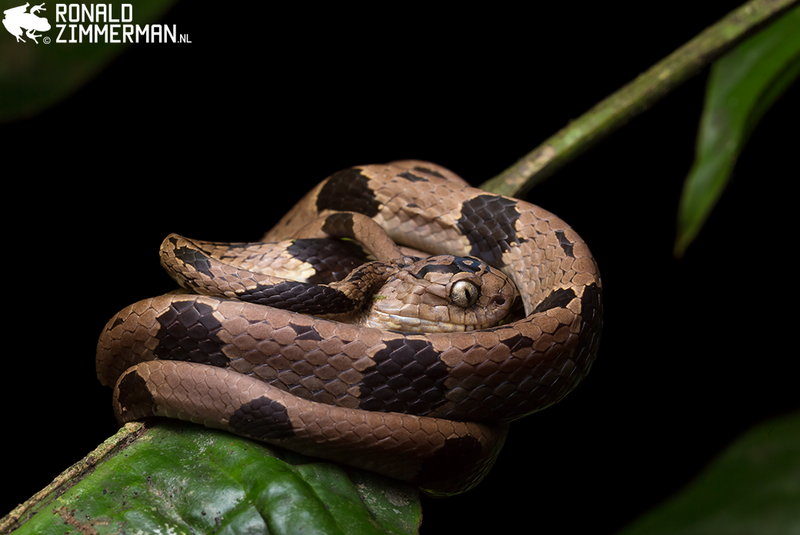 This arboreal Amazonian snake can also occur in disturbed areas and even in houses located next to forest patches. It feeds mainly on mammals (including rodents and bats) and birds. Another good biological “pest” control! 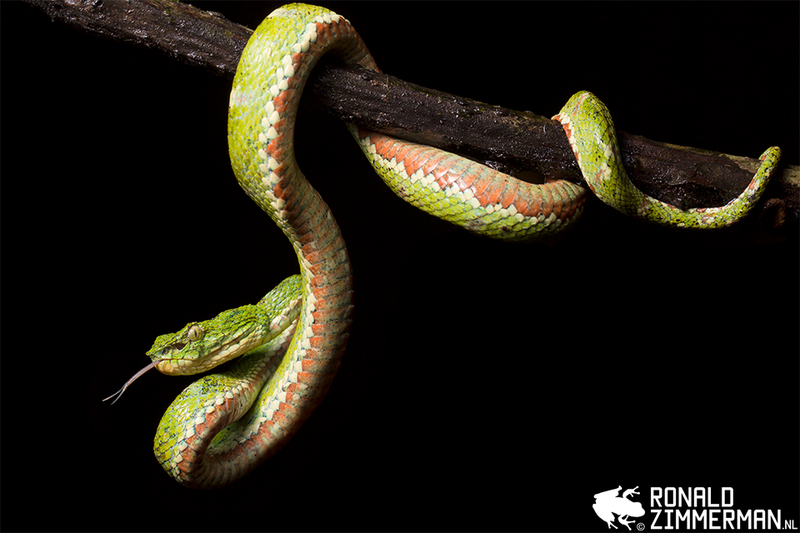 It was a nice surprise when Dieuwertje and Jasper gave me the chance to photograph this amazing snake. 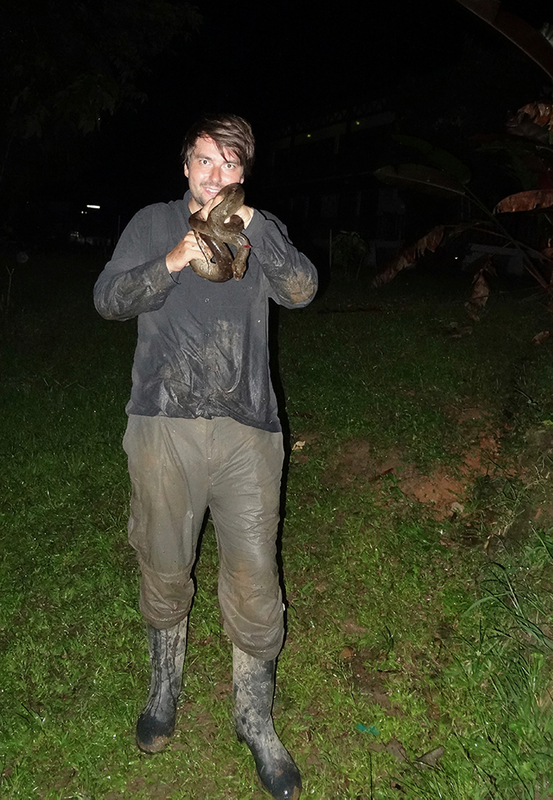 On the last night of our stay two Mexican herpers had found a Green Anaconda Eunectes murinus in a ditch next to the research station. The snake had cloudy eyes and was crawling through the mud all the time. The next morning we would leave to the next location. I did not make a memorable photograph, but had a great memory. Our stay at the Estación Científica Yasuní was amazing and we also had some very good nights with a lot of wildlife. The nights were a bit black or white, and nothing in between. During good nights we found a lot of different species, but on bad nights nearly nothing. After some amazing days in the Ecuadorian Amazon we went to another “not so warm and wet location” on the east side of the Andes called Cabañas San Isidro’s lodge. It was a great place for birds, but it was not so great for amphibians and reptiles. I enjoyed myself watching and photographing hummingbirds on this location, while drinking coffee. Mindo was one of the locations I really wanted to visit. If you have ever looked into the book “The Amphibians and Reptiles of Mindo: Life in the Cloudforest” you know why I was so excited (if not, you should). 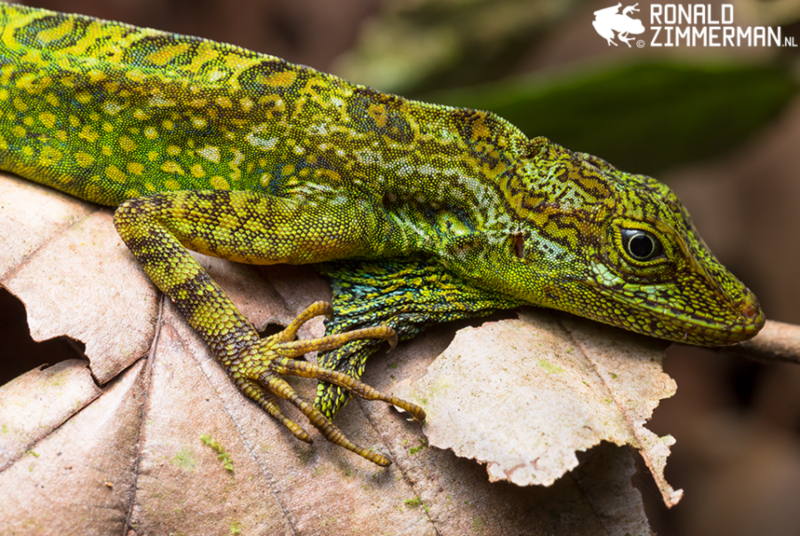 One of my dream species the Pinocchio Anole Anolis proboscis is endemic to Mindo. During our first stop in Mindo we stayed at El Séptimo Paraiso. More luxury than we are used to, but sometimes you have to be very nice to yourself. The trails were superb, we found some awesome species, and had a pizza night. The Equatorial Anole Anolis aequatorialis was one of the few reptiles that I found during the day on the property of El Séptimo Paraiso. The lizard was perching almost at ground level. After a few photos the anole moved up a tree. 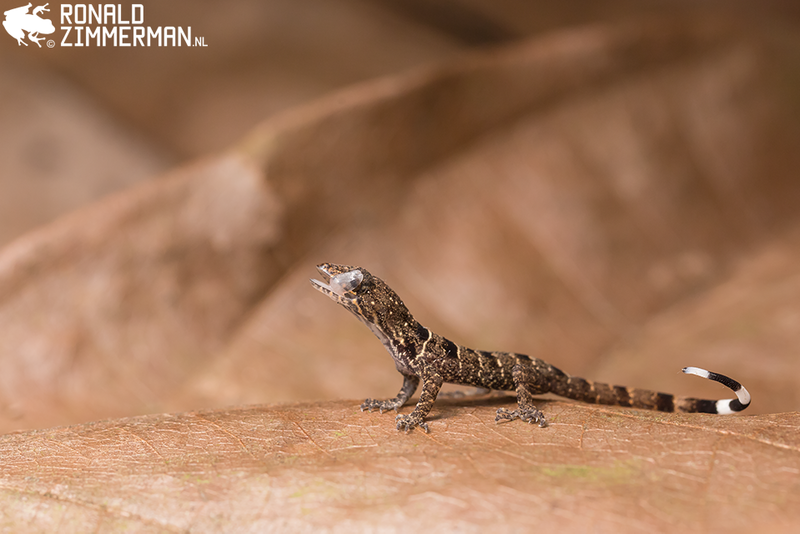 The Equatorial Anole was the most commonly seen anole during our stay in El Séptimo Paraiso. The night hikes were not fantastic because it had been dry for a long time. 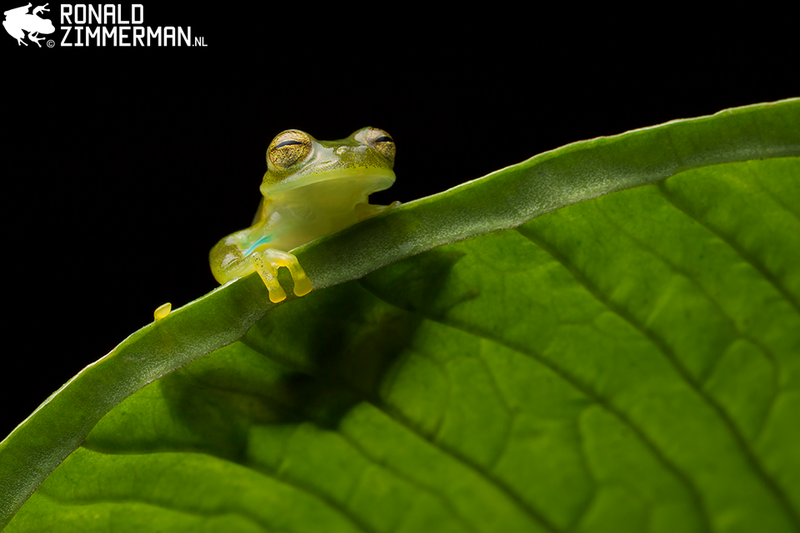 Despite the weather we did see three Emerald Glassfrogs Espadarana prosoblepon during the first night hike. The blue things in the armpits are the humeral spines. Males have notably enlarged humeral spines. Male glass frogs engage in fights, and males have been observed using their humeral spines in a weapon-like context. Dewlaps are very important for anoles. Anoles use the dewlap to communicate with each other. During the night hike I found an Equatorial Anole Anolis aequatorialis holding his “precious dewlap” while sleeping on leafs. Anoles sleep on leafs because the leafs will move if disturbed by a predator. Shake and wake! During our stay we met Frank Pichardo of Tropical Herping. We knew each other from Instagram and Facebook. He is a great photographer and also very passionate about wildlife. It is always great to meet like-minded people in real life. 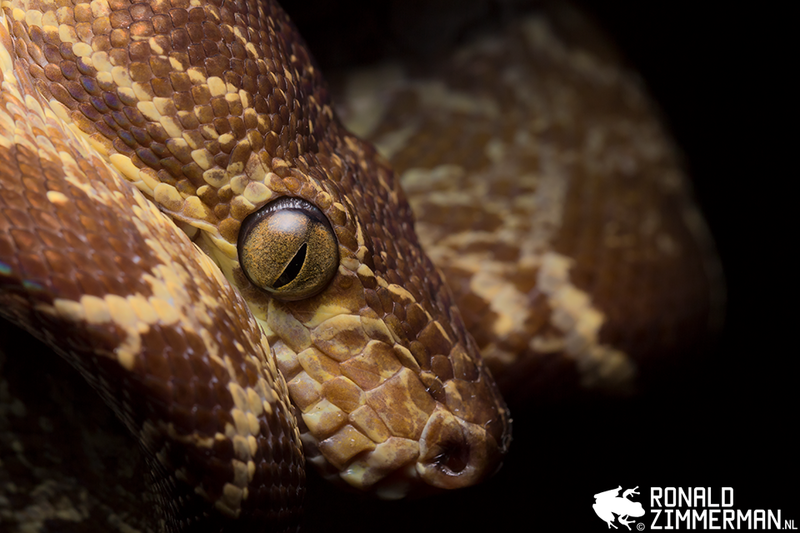 He showed me some great animals, like this amazing Osborne’s Lancehead Bothrops osbornei. 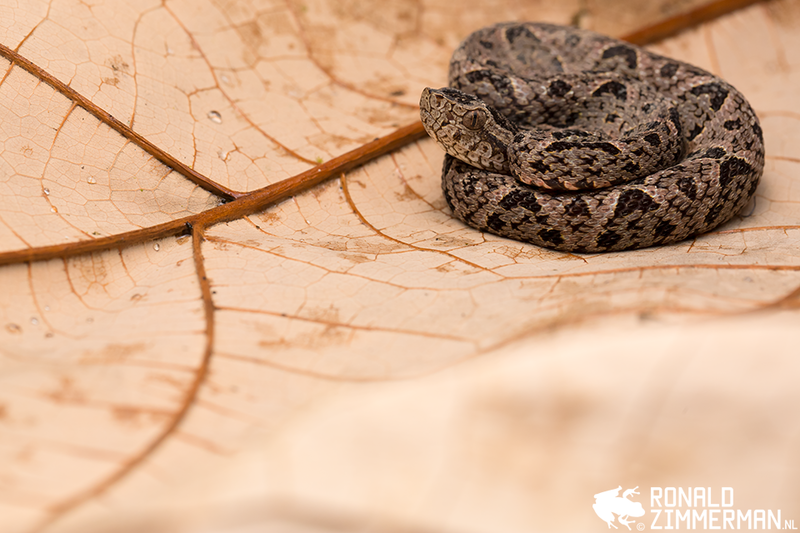 It was the first Ecuadorian viper of the trip. Thanks Frank! The second night hike was not as good as the first. Being on the same location, with almost the same weather, one day later, and seeing barely nothing was something I knew from Yasuni National Park. Working hard and seeing almost nothing was no exception during the whole adventure in Ecuador. Totally different than Costa Rica for example. Pinocchio Anoles, the anole I really wanted to see, are usually high in the canopy and sometimes on lower branches. I had been looking for hours without luck. The next week we would visit Mindo again to try our luck again. Another highly anticipated location was the Bilsa Biological Reserve in the Ecuadorian Chocó. The Chocó is one of the most biodiverse regions of the world. Unfortunately 95 to 98% has already been destroyed. I have seen it with my own eyes. I saw a lot of palm oil plantations on the way to the reserve. If you want more information or do something about this issue, visit (and follow) Save the Chocó on Facebook or check out their website. Our friend Matthijs Hollanders joined our group in the Bilsa Biological Reserve. 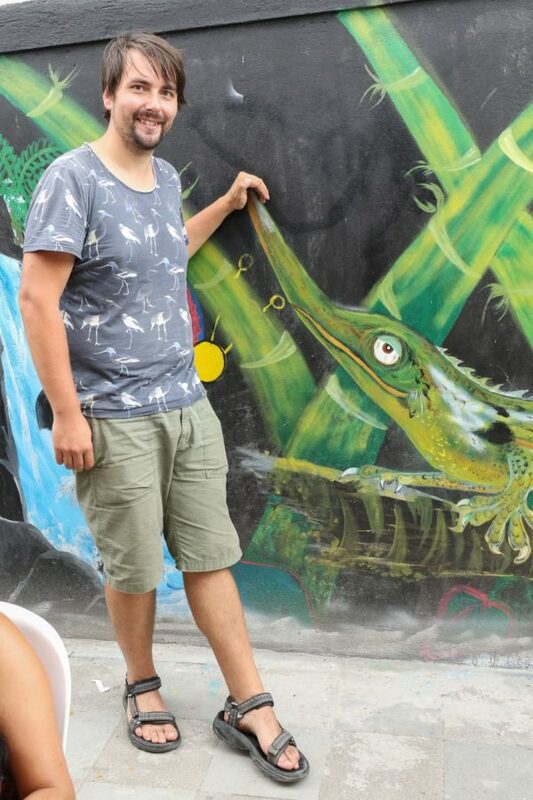 Matthijs is a biologist and was doing an internship at Tropical Herping. 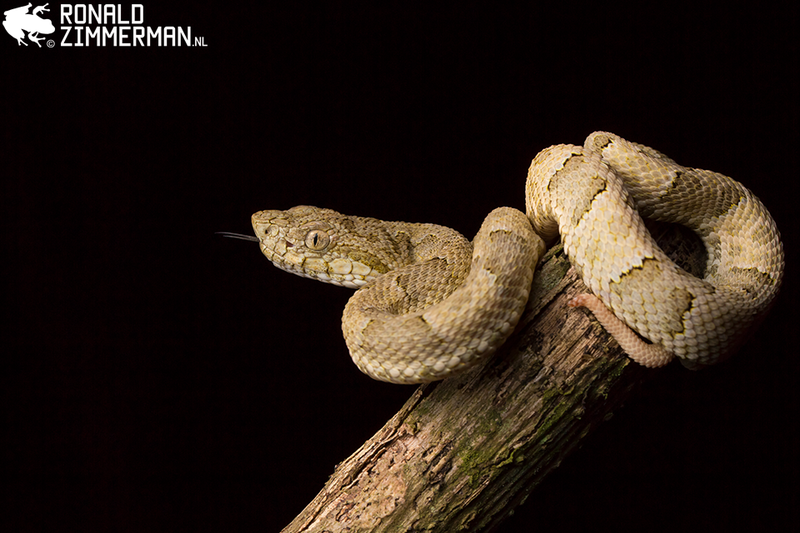 He is also a very talented photographer and herper, now posting a lot of great photos on his Instagram. On arrival we met Sebastián for the first time. He is from Ecuador and was already at the station. He was great company during our night hikes. Very soon the Chocó showed us why it is essential to be saved. Sebastián found a Northern Eyelash-boa Trachyboa boulengeri. 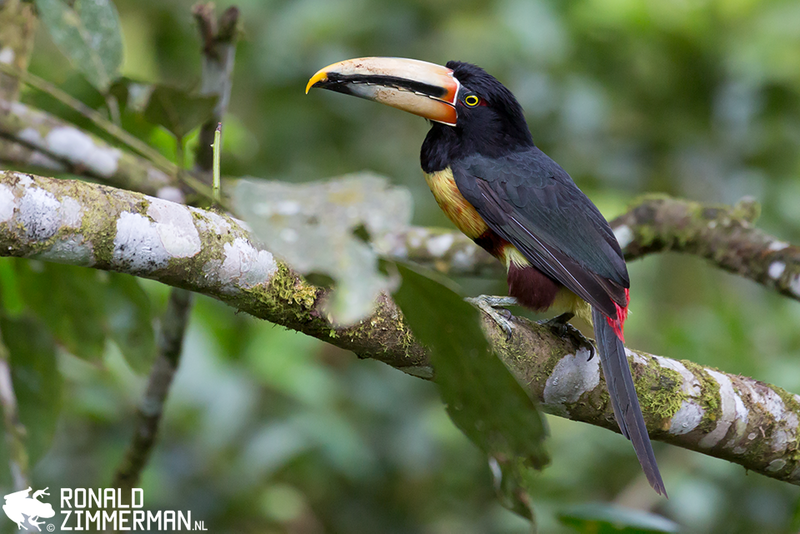 An iconic species of the Ecuadorian Chocó. What a start on this location! 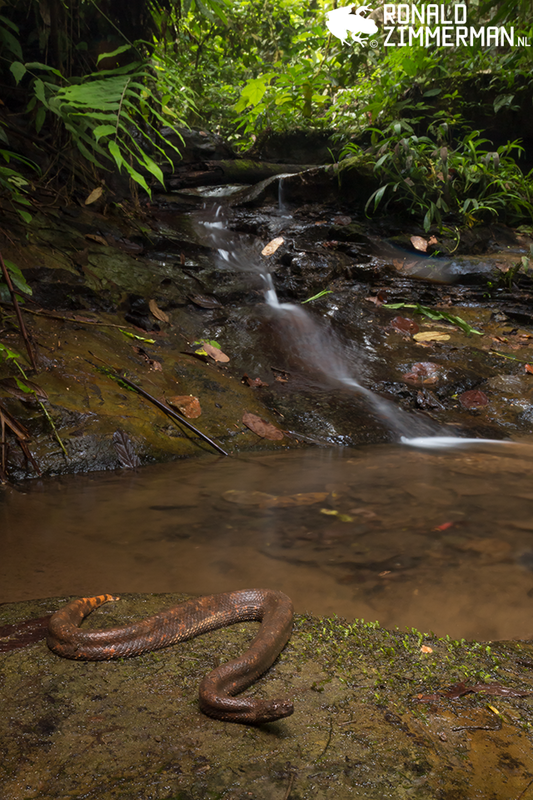 The stream where we found and photographed the Northern Eyelash-boa became our favorite stream of the reserve with many treats. Another treat was the Ecuadorian Blue Glass Frog Cochranella mache. 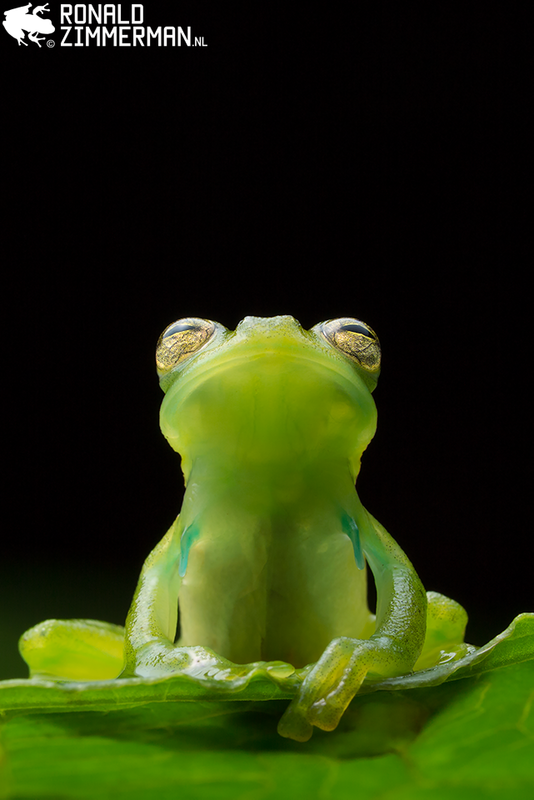 It is one of the most beautiful glass frogs I have ever seen. The species occurs only in a few protected areas in the Chocó like the Bilsa Biological Reserve (within the Mache Chindul Ecological Reserve). 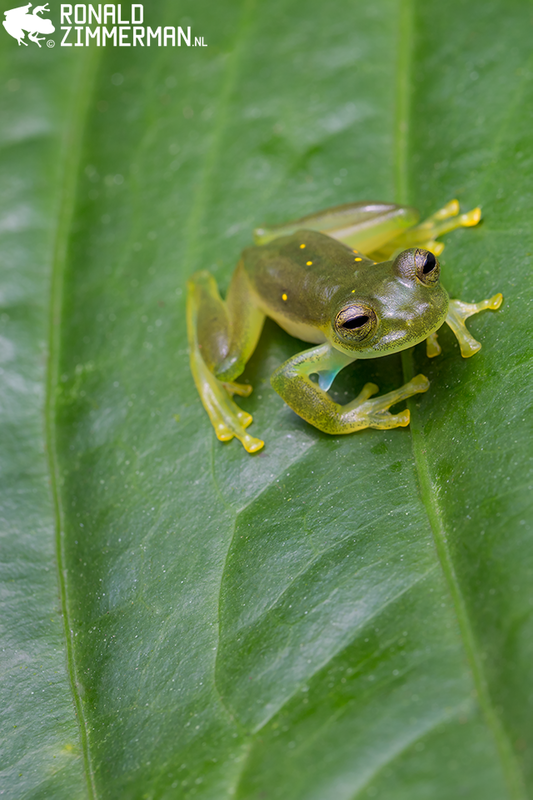 The IUCN Red List status of this glass frog is endangered because of habitat loss and fragmentation in its already small extent of occurrence. 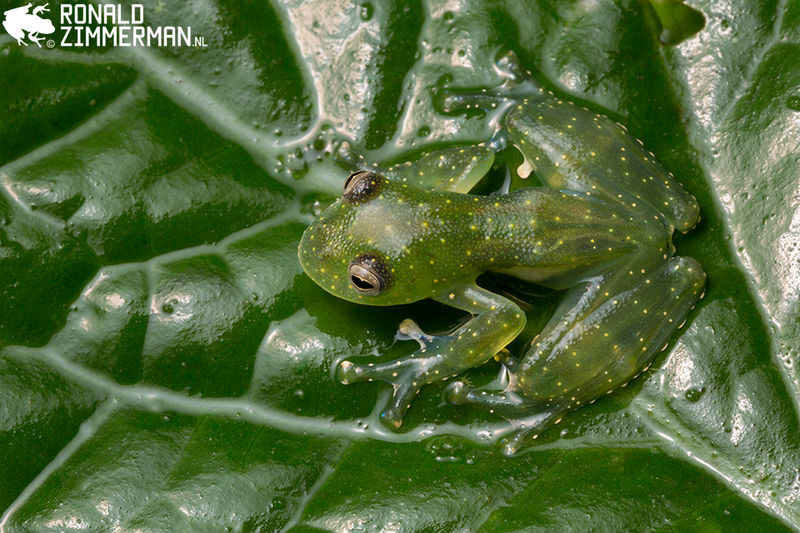 The Ecuadorian Blue Glass Frog is rare or just difficult to find. We found only one specimen on vegetation close to a small stream. 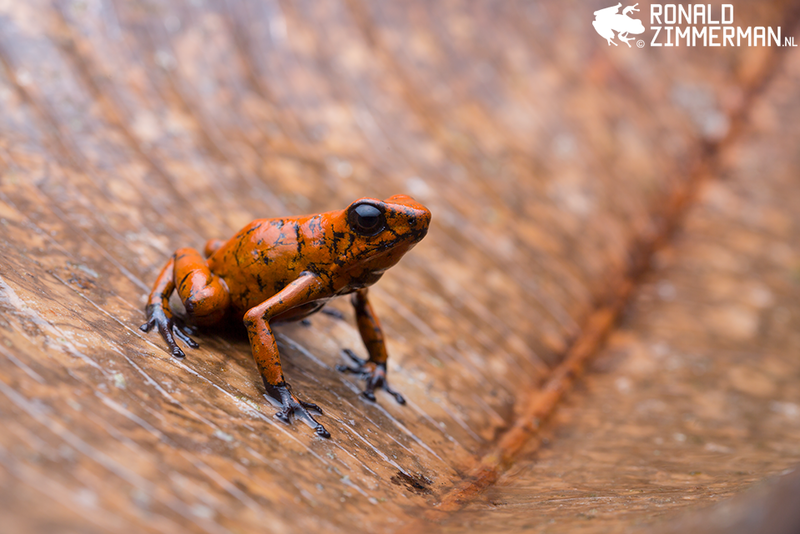 We found multiple specimens of the Diablito Frog Oophaga sylvatica varying from gold/orange to red. 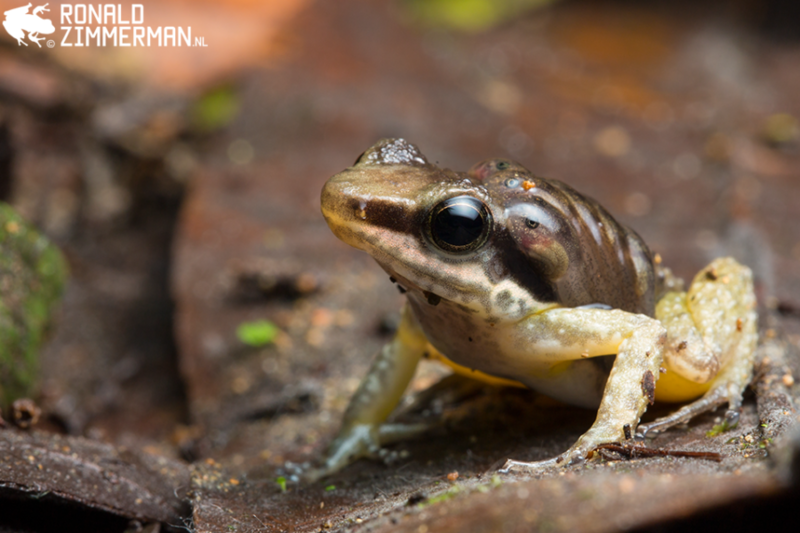 The Diablito Frog is a very common frog in Colombia but has disappeared from much of its Ecuadorian range. It is threatened by habitat loss (deforestation) and agricultural pollution. As for many good looking species, it is sometimes seen in the international pet trade. 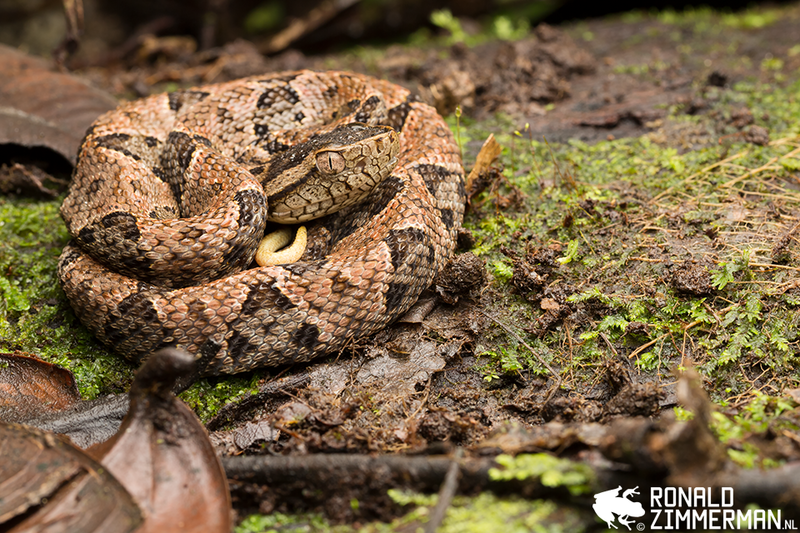 Last year in Costa Rica I saw many Terciopelos Bothrops asper during the night hikes in the Costa Rican Amphibian Research Center. In the Bilsa Biological Reserve we only found juveniles. Surprisingly they were not aggressive at all. 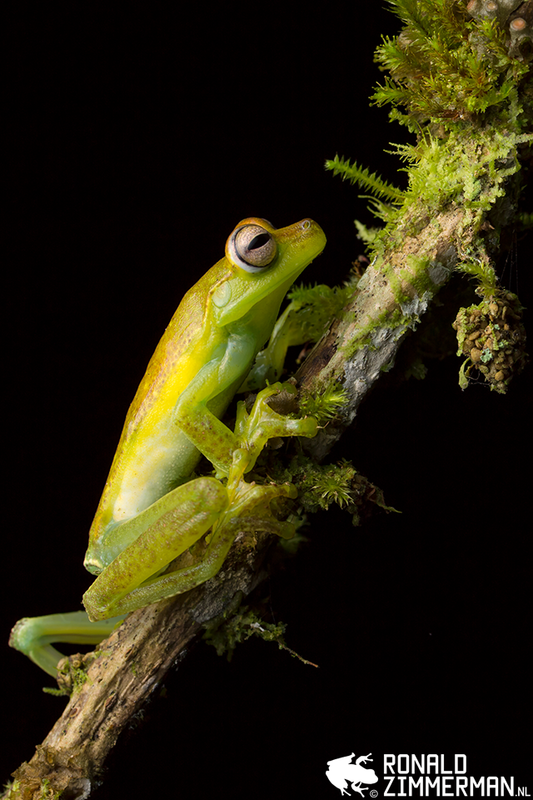 Terciopelos are semi-arboreal and perch on vegetation up to 150cm above the ground. 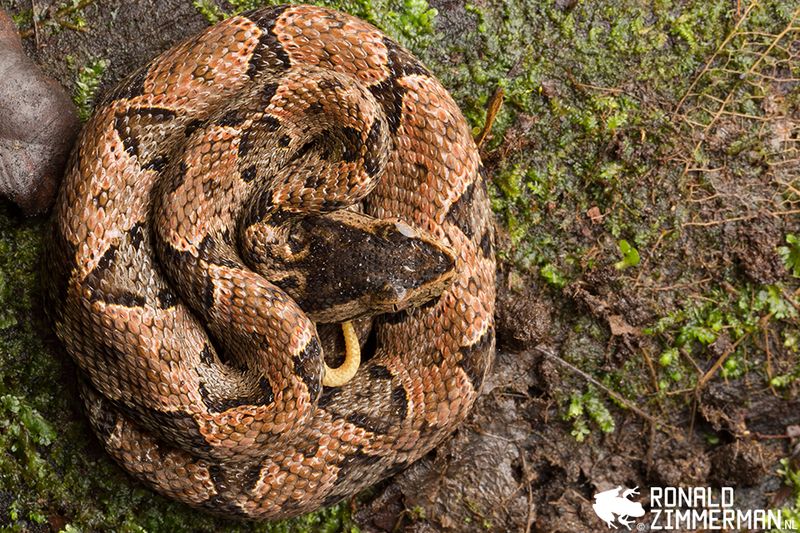 Juveniles are more venomous than adults and use tail-luring. They use their bright tip of the tail to lure prey. 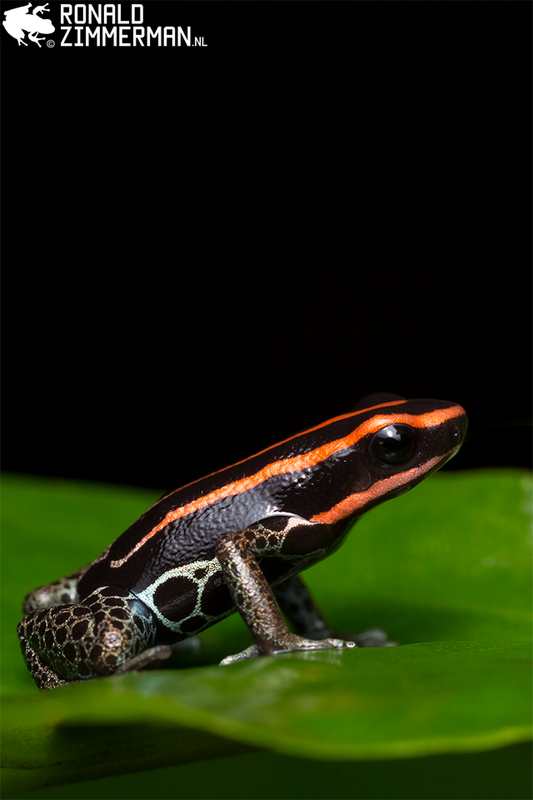 Juvenile terciopelos feed mostly on lizards, insects, centipedes, frogs, and other snakes. The species is known to be very aggressive, but none of the specimen we had encountered was. The Terciopelo is an highly adapted and widely distributed species with large and stable populations that thrive in human-modified environments with a lot of rats. Overuse of pesticides, decline of prey (for example frogs) can affect populations of the species, but the ability adapt to new environments makes it very likely that the species will survive for a while. Vinesnakes were very common in the Bilsa Biological Reserve. This Blunt Vinesnake Oxybelis brevirostris showed me a defensive display. 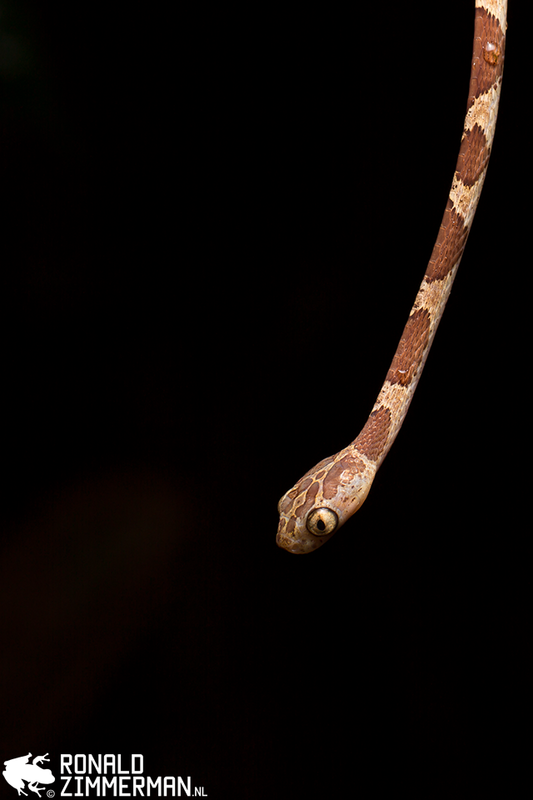 Strikingly the snake was not aggressive towards me, but to his own reflection in my macro lens. 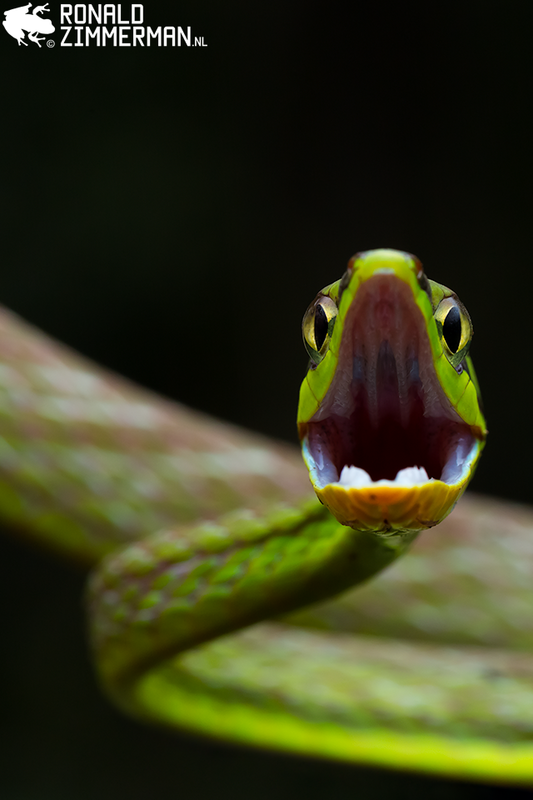 The Blunt Vinesnake is an active diurnal species that feeds on frogs and lizards. As an arboreal snake it is dependent on good forest. As you can see on the photo the snake is rear fanged. You can see the fangs almost in the snake’s throat. That means the snake has to “chew” to envenom its prey. The venom is not dangerous to humans. Most of the time we had to work hard to see spectacular amphibians in Ecuador and sometimes you just have to sit next to a bonfire. 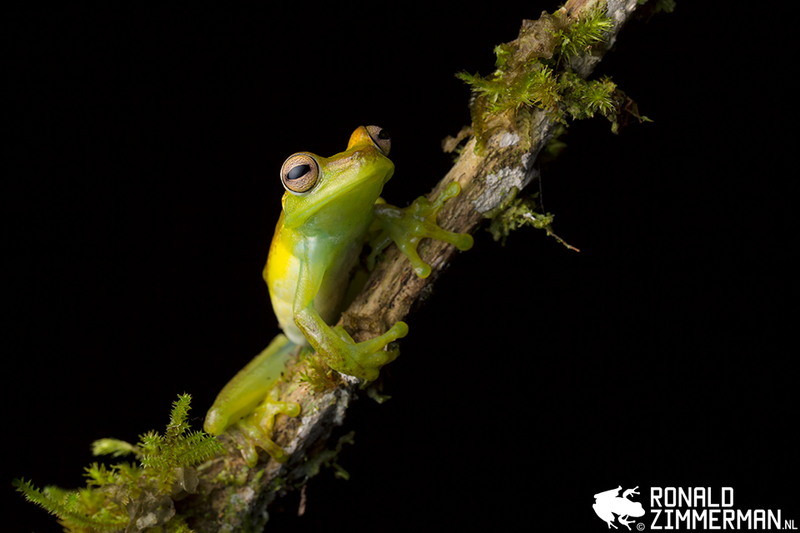 A Gliding Treefrog Agalychnis spurrelli was sitting next to the Bilsa Biological Station. I was really amazed on how big this specimen was. It was much bigger than all the Red-eyed Treefrogs Agalychnis callidryas I have seen in Costa Rica (another species from the same genus). 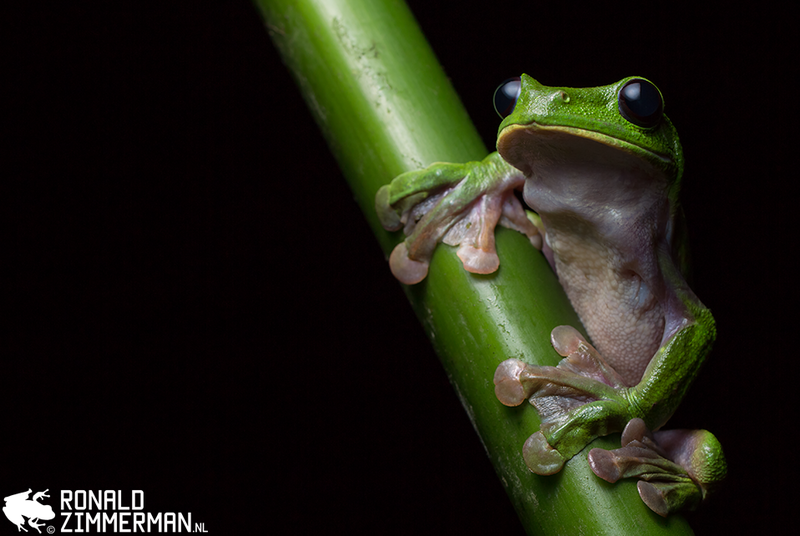 It was my first Gliding Treefrog, so I have nothing to compare. 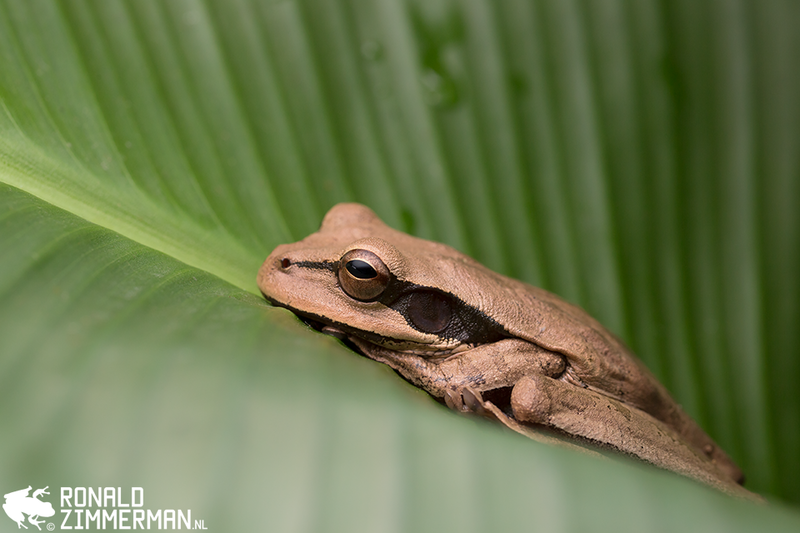 The Masked Tree Frog Smilisca phaeota was found on the same spot earlier during the day. As if this frog wanted to be found. It was an amazing experience staying in the biological station. Everything was very basic, but good enough. As soon as you stepped into your boots and walked away you were in the wilderness. Not all night hikes were spectacular, but some definitely were. Matthijs and I also did an “all-nighter”. We came back in the morning when the birders were already preparing for a trip. During the night hikes there is also a big chance of seeing some amphibians and reptiles being active and showing natural behavior. Photographing them in situ without manipulating them is a great challenge, with sometimes great results. 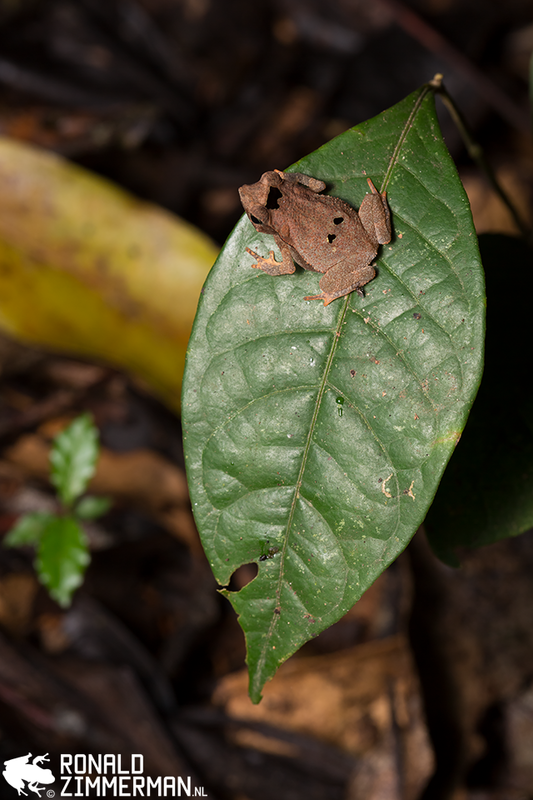 From a normal viewing distance rainfrogs (Pristimantis) are small and brown. 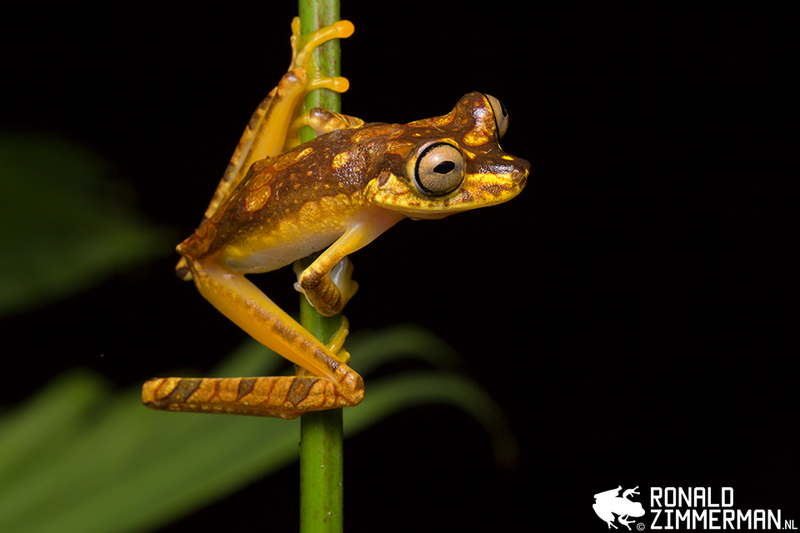 When you look more closely some of them like this Pristimantis rasadoi can be absolutely breathtaking. In this case you can see two breathtaking frogs. And no, he is not just hitching an ride. They are doing serious frog things on a leaf. This is one example of a “rewarding in situ photograph”. Another great example is this photograph of an Andean Snail-Eater Dipsas andiana. The Andean Snail-Eater is a nocturnal inhabitant of the Chocó. I am a terrible snake poser, so I was very lucky with how we had encountered this snake. 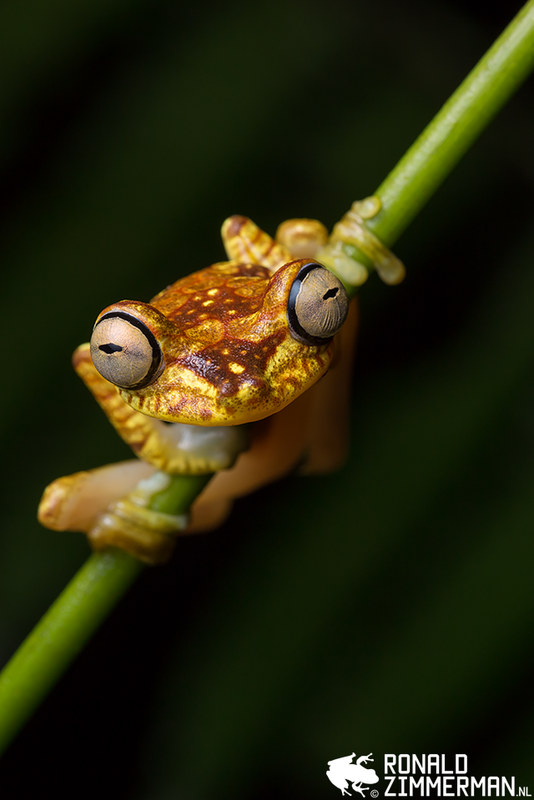 Imbabura Tree Frog Hypsiboas picturatus is the iconic frog of the Chocó. Common as they were in the Bilsa Biological Reserve they were one of the most beautiful frogs out there. 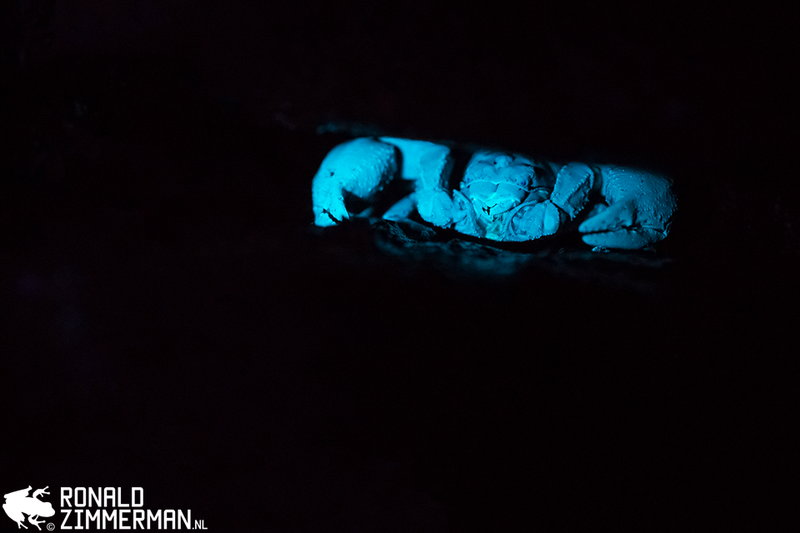 When you photograph scorpions with a UV-flashlight they glow and become bright blue. This scorpion was hiding inside a crack in a defensive pose. It was a great opportunity to test my new UV-flashlight. Another interesting encounter was this “Chewbacca spider” (Star Wars-fans will see it) next to her home on a leaf. The next day I looked for this juvenile tarantula Avicularia sp., and the spider was inside her home. If you look more closely you can see the spider is missing two legs. One of the greatest observations was this Colostethus sp. with tadpoles on the back. We did not want to disturb this frog too much, so we did some in situ photographs. 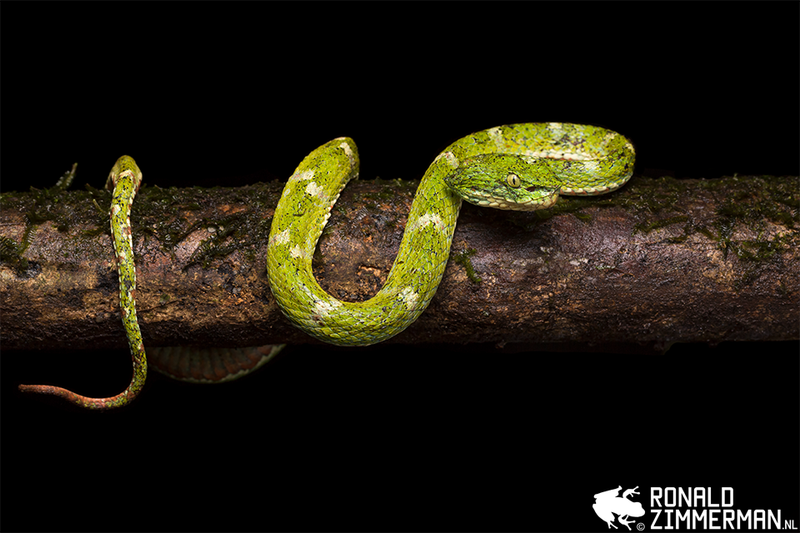 The Eyelash Palm-Pitviper Bothriechis schlegelii is one of my favorite snake species. 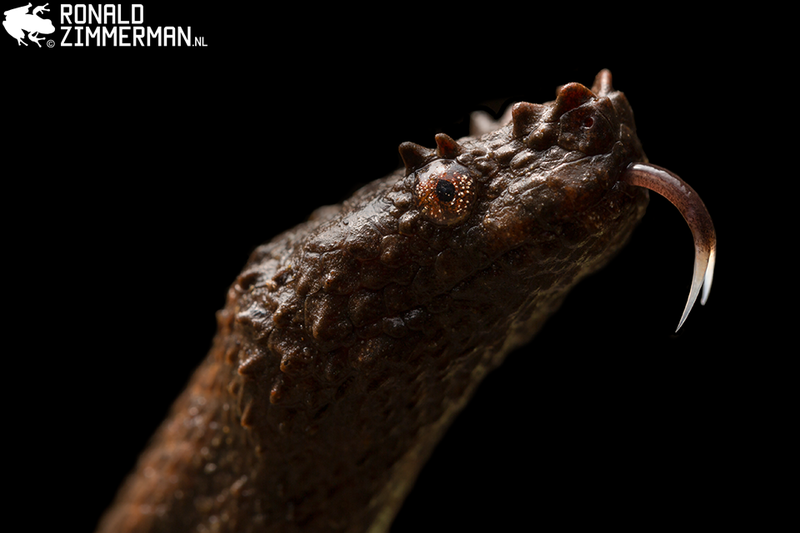 In Ecuador the colors and shape are different than the Eyelash Palm-Pitvipers in Costa Rica. For now they are still the same species. 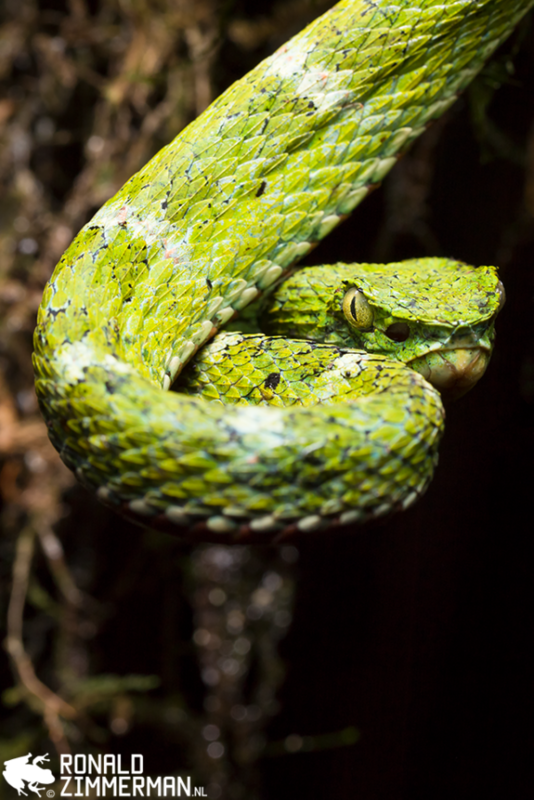 The Eyelash Palm-Pitviper is a venomous ambush predator. 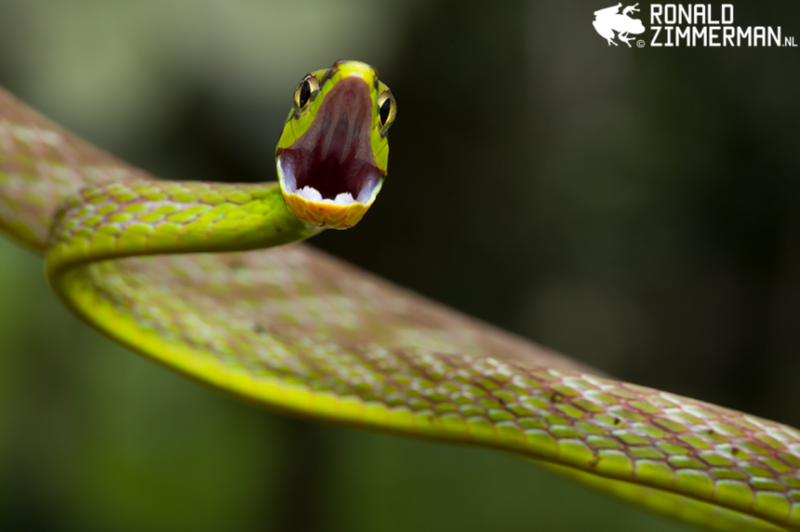 They are very docile snakes, but dangerous for its arboreal lifestyle. They can bite in the neck or face for example when walking through dense foliage. This individual was perching on a tree trunk, almost at ground level, during our last night in the Bilsa Biological Reserve. Most likely in ambush position to catch a prey like a lizard, bird, small mammal, or frog. Matthijs and I were standing next to the snake, but Sebastián was the hero for noticing this so much desired snake! The Eyelash Palm-Pitviper was like the cherry on the pie. The Chocó tasted sweet. The Bilsa Biological Reserve was by far the best location of the trip for amphibians and reptiles. As I wrote before, 95 to 98% of the Chocó has already been destroyed. The small crumbs that are left, are worth saving. My feet were killing me after all those nights walking on boots in the mud. No regrets! We went to Monpiche to see humpback whales. I hoped to see them jumping out of the water. I went on one rough boat trip to see them. 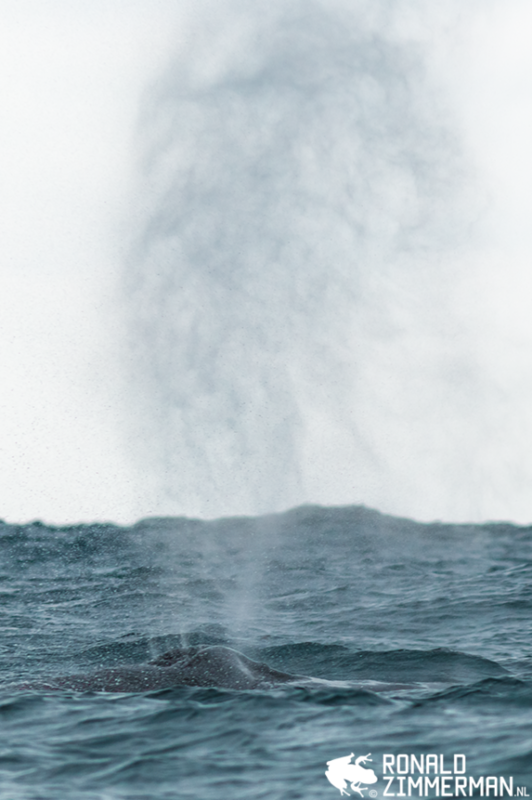 We got very close to some humpback whales, but they just showed us some fins. Maybe my expectations were too high or it was just disappointing. On the other end I saw more amphibians and reptiles than I had expected, and swimming in the sea was nice for a change. Our last episode was a second stop in Mindo. This time we went to Hacienda San Vicente and Mindo Lago. After three weeks of adventures I got a little tired. Hacienda San Vicente had by far the best trails in Mindo. The trails started after a long walk up the hill. 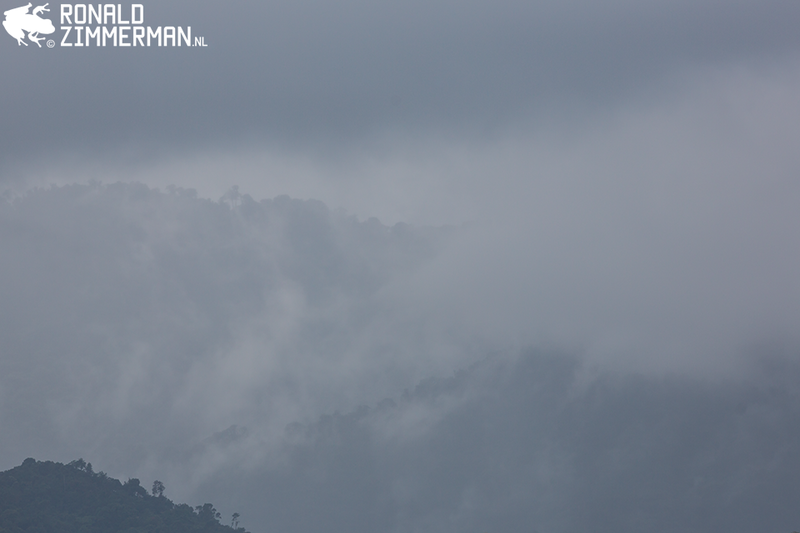 On the hills surrounding Mindo you can see clouds arising from the trees. I loved the view. 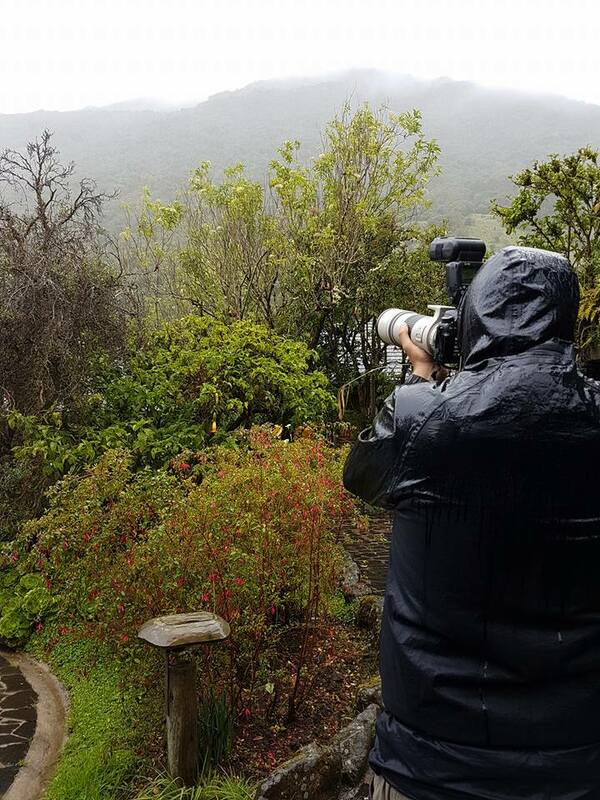 You can see “the cloud forest at work”, evaporating water that will rain down somewhere else. I spent a lot of time just chilling near the cabin. A Pale-billed Araçari Pteroglossus erythropygius was flying around the cabin. Another great episode on my “bush television”. In the Bilsa Biological Reserve my feet started hurting. After a few nights with hours of walking through mud and steep climbs, on boots, my feed had enough of it. The climb to the trails at Hacienda San Vicente became too much. I decided to walk along the river and had a close encounter with a Western Basilisk Basiliscus galeritus. 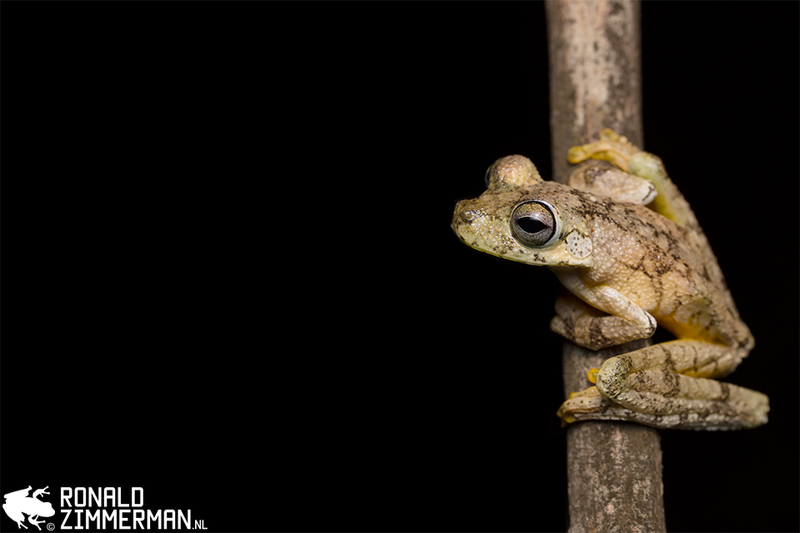 During the first night I walked all the way up to the trails without finding much, but I found this beautiful Palm Treefrog Hypsiboas pellucens near the cabin. We spent our last night in Mindo Lago. I tried to find the Pinocchio Anole at some known places, but again without the desired result. 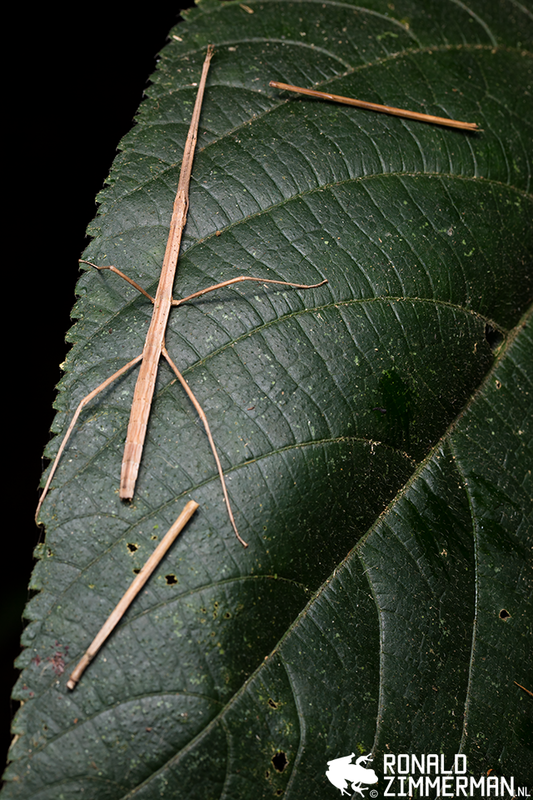 On my way back I saw this stick insect on a leaf with real sticks. Impressive camouflage! 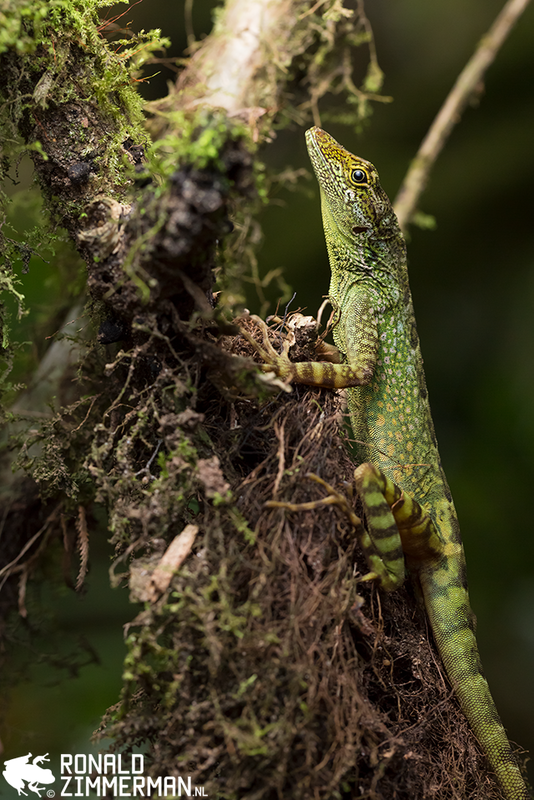 The one species I really wanted to see and photograph was the Pinocchio Anole Anolis proboscis in Mindo. I tried hard, but unfortunately I did not find a real one. I did find this wallpainting in the town of Mindo. I have a good reason to visit Mindo (and other parts of Ecuador) again. This list includes the amphibians and reptiles mentioned in this report, but also the ones I had encountered but decided not to include in this report. In this report I just included the photos I really like. For some species that means that the photo was not good enough, or I did not photograph the species. Photographing, editing my photos, and writing a report costs a lot of time and energy. I love doing it (it is my passion), but it would be great if you ‘like’ or ‘share’ this report. Also writing a reply feels very rewarding. Feel free to ask me for information when you are planning your own adventure to Ecuador. You can find more about my techniques in the blog post about the gear I recommend and the blog post about flash photography. If you want to see more of this adventure you can also go to Jasper Boldingh’s Wildlife (photos) and Dieuw’s Wildlife (videos).